Here are some of the photos from the Tablescape I did for my mom's wedding today! Enjoy! My mom wanted an outdoor wedding, so she picked September 25th, thinking it would be crisp and cool--it hit 98! Plus it was super humid! She wanted all Fall colors as wedding colors--having the fallen leaves, pumpkins, and gourds helped disguise the heat a little, but it was still steaming hot today! Plates and napkins served up in galvanized tin buckets. Forks in a crusty old urn. Sorry about the grainy photo (It's no worse than what I've seen in some rather big magazines), but I just love the detail on this little urn! Lucky for me, I have a pair! Silk leaves, gourds, pumpkins, and more galvanized tin ruled the roost in this Fall Tablescape! There was a nice breeze, so I snatched a candle to hold down the napkins! It was so hot, we had to keep most of the food inside! Mums in a vintage French flower bucket make this vignette stunning! Below are some photos of the decorations on the pier at my great-uncle's house where the actual ceremony took place. My great-aunt, Jeanne, and her son, Joel, get the credit for these decorations! 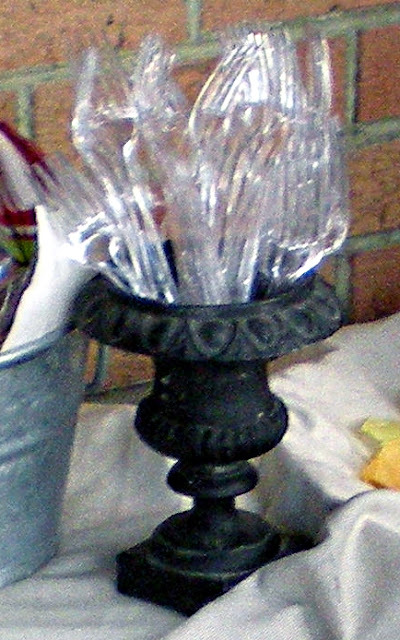 Fancy that--a much bigger version of the urn I put forks in! Here are a few photos of the beautiful riverfront--this is my great-uncle's back yard. Buckets, burlap, linen, cast iron, galvanized metal--all crusty non-traditional wedding decor that really turned out stunning, if I may pat myself on the back! This was my mom's wedding bouquet--yellow roses! They smelled so good! I adore the crusty patina of this French flower bucket. I love how everything looked after dark! I hope you all enjoyed these photos! This was a special day for my family, I'm glad I was able to share it with you! Let me know what you'd like to see on my blog! I'm open for suggestions! I'm linking to a host of places you can find in my sidebar!